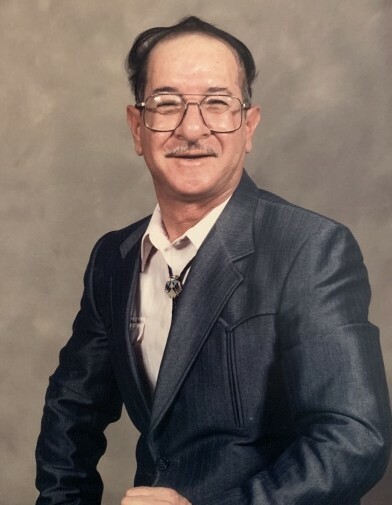 Manuel M. Mirabal passed away on February 3, 2019 in Milan, New Mexico surrounded by his loving family. He was born on November 24, 1939 in San Mateo, New Mexico. He was 79 years of age. Mr. Mirabal served in the Army National Guard for 22 years. He worked for Kerr McGee, Plains Electric and District 6, of the New Mexico State Highway Department. He was former member of the Grants Milan Elks Lodge. He enjoyed camping, watching wrestling, and westerns, but will be remembered for the time, the love and enjoyment he had for his family, especially his grandchildren and great-grandchildren. He was loved and will be deeply missed. He is survived by his wife Helen Mirabal of the family home in Milan. One son; Richard M. Mirabal. Three grandchildren; Misty Jaramillo (Timothy), Moises Mirabal, and Matthew Mirabal. Two Great-Grandchildren; Noah Jaramillo and Maci Jaramillo. Three sisters; Erlinda Harris, Irene Marez, and Jean Vasquez (Cecil). He was preceded in death by his parents; Moises and Onesima Mirabal. One sister; Tina Padilla. There will be a Visitation beginning at 6:00 PM followed by a Rosary Vigil at 7:00 PM at St. Teresa of Avila Catholic Church on Thursday February 7, 2019. Then at 10:00 AM a Funeral Mass will be celebrated by Father Alberto Avella also at St. Teresa of Avila Catholic Church on Friday February 8, 2019. Interment will follow at Grants Memorial Park. Pallbearers include; Richard M. Mirabal, Moises Mirabal, Matthew Mirabal, Timothy Jaramillo, Jason Morales and Albie Gurule. Honorary Pallbearers include; Misty Jaramillo, Noah Jaramillo, Maci Jaramillo, and Tommy Padilla. Cope Memorial Chapel of Gallup is entrusted with arrangements.